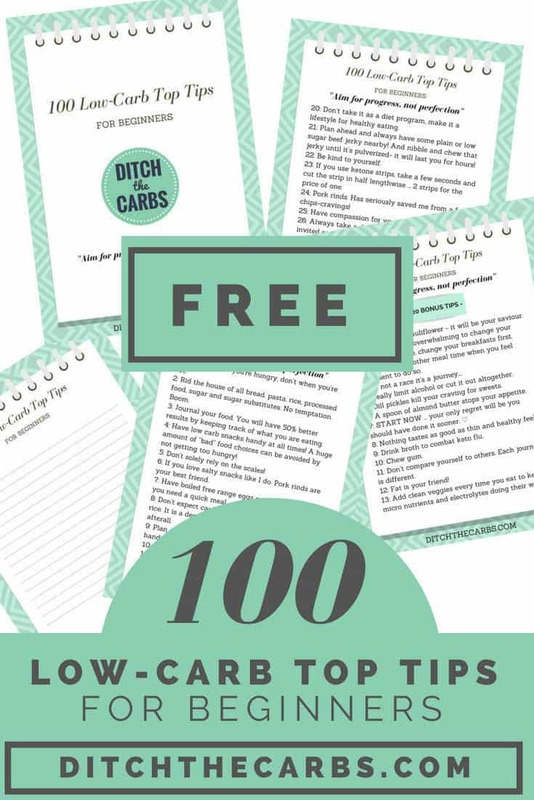 100 Low-Carb Top Tips For Beginners – it’s FREE – and it’s awesome! PLUS, scroll below, there are 20 bonus tips included for you. This list was compiled by asking the amazing community within my support group. And that’s why I am including 20 Bonus Tips – they offered so much help, I couldn’t narrow them down to just 100 Low-Carb Top Tips For Beginners. Before we start, why not join my closed Facebook Low-Carb Support Group. This is my super friendly community of amazing people just like you, who are there to help support one another to succeed. They are the ones who helped me compile such a phenomenal list of top tips. It is a place to discuss all things low carb, in private. Ask me anything. See others share their success stories. See what everyone is cooking. Pick up new ideas. Get the support and friendly help that you need from others who are just starting out, and from those who have lived LCHF for years and know all the tricks for success. I’ll see you there. My FREE newsletter service includes regular helpful, educational and entertaining posts, tips, guides, occasional promotions/products/special offers and of course recipes (including exclusive recipes not found on the website). 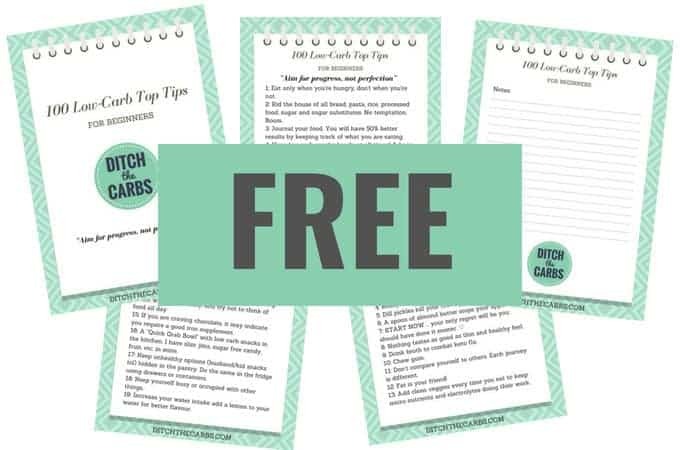 When you subscribe to my newsletter service, I give you instant access to my FREE 100 Low-Carb Top Tips For Beginners + 20 Bonus Tips. I’m already a subscriber but would love your book. Where do I add my details? Add the above and the eBook will automatically be sent to you. As long as you use the same email address you are currently subscribed with, you won’t be receiving my newsletter twice (that’s no fun for anyone 😉 ). Hi Libby, Would love to have the book, really enjoyed your video and gave me a lot of inspiration, I am doing the Intermittent fasting 7 days a week as only have lunch and dinner but miss having my coffee in the morning as I was told you can’t have cream in it, is that true please ?? I’m glad you are loving my Facebook LIVE Q&A sessions, enter your details above and I will send you the 100 Top Tips immediately. As for fasting, the absolute gold standard is to drink water only for a true fast, but many people have variations and drink bone broth or creamy coffee to see them through and to avoid overeating when their fast is over. Do what works for you and is sustainable. Too many people go too hard too fast and then ruin it all by grazing all night long. Can you please send me the 100 LOW-CARB TOP TIPS FOR BEGINNERS ? I could not download it. Please enter your details above and it will be sent immediately to you. Please send me the newsletter and 100 Low Carb Top Tips. Thank you. Hi Jayne, just pop your details in the box above and I’ll email it to you immediately. Hi I have subscribed but I’ve never received access to your ebook. Hi Kate. I have searched in my email system and the email you used to comment here has never signed up for the newsletter service and bonus eBook. Enter your details in the subscription box below, and my system will send you your ebook as if by magic instantly 🙂 There are even 20 bonus tips too. Please send me the newsletter and 100 tips… I would like to join the support group if I don’t have Facebook! Is there another way to join support group? I’ve been doing for almost 2 months and not successful.. I’ve lost 3 lbs and some inches; getting discouraged! Ercie head back up the page and enter your email details to access your free eBook. You may unsubscribe at any time (I don’t want to be cluttering up your inbox). I’m afraid the support group is only held through Facebook. I’ve had the gastric bypass surgery. I’ve lost #200 lbs. 100lbs to go. but I like sweets if I can get off sweets ill be really small. but I’m weak at times but ill be ok I’m not going to give up. Awesome Aleasia, such a great attitude to never give up. I love it. I can’t find any link to download the 100 tips. I tried to use the link provided in the text message but it just loops back to the 100 tips original sign up page. I have tried on clicking everything on that page and even requested a new text with the download link. Every link that says 100 tips…loops back to the sign up page. Also don’t see any 20 recipes on this page as indicated. I am not knowing where to start with all this but thank you for allowing me to subscribe and I look forward to all the advice one can give me. I signed up and got the welcome emai but didn’t receive the 100tips download link. I love the recipes you share on FB, so I’m sure I will enjoy this freebee! Thank you so much! I am diabetic, and need to lower carbohydrate intake. How do you get this if you’re already a subscriber? Just add your details, you won’t be added twice, my email system will only add 1 subscriber per email address.